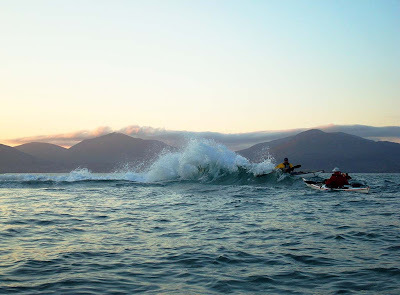 Sea kayaking with seakayakphoto.com: Sunset surfing on the Corran Ra spit, Taransay. 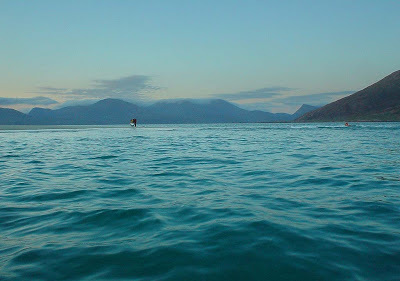 Sunset surfing on the Corran Ra spit, Taransay. Clark and Douglas at the Corran Ra wave. Photo Jennifer Wilcox. 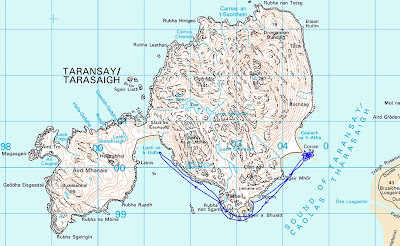 Like many of the smaller Western Hebridean Isles such as Pabbay, the Atlantic swell wraps round both sides of the island of Taransay. Where the swells meet a sand bar is created. You can surf in on a wave then meet another wave coming in the opposite direction. Where they meet... Kapowwww! There was considerable testing of rolls, rescues and dry suits! Andy broke his paddle on a vigourous stern rudder. He made several vigourous attempts at bracing with half a paddle but ultimately enjoyed a taste of salt water. Fortunately he carried splits. 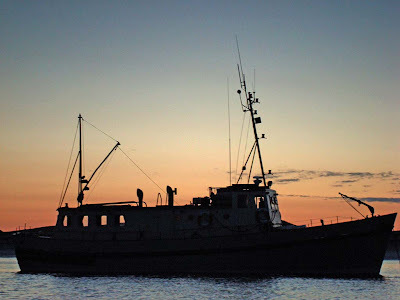 ..... and returned to MV Cuma at 11pm. 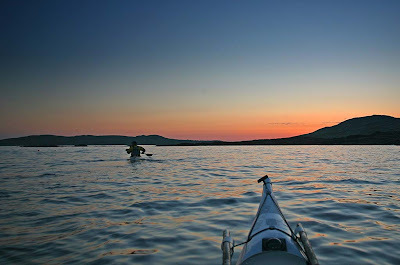 Our first day's paddle had covered only 11km at Taransay. However, Tony, Jennifer and I had already covered 11km that morning in Loch Roag.